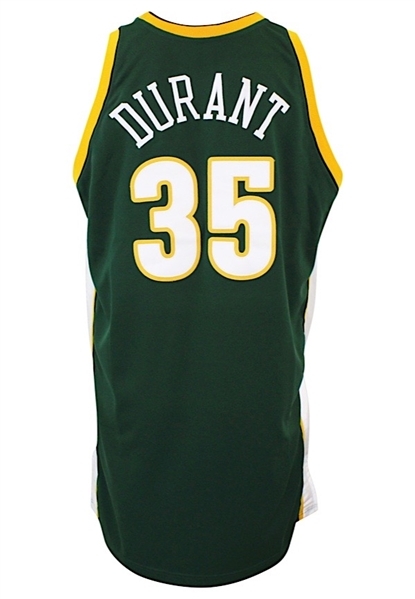 Kevin Durant was taken second overall in the 2007 NBA Draft by the Seattle SuperSonics/Oklahoma City Thunder. Durant's 20.3 point per game season average broke the franchise rookie record set by Bob Rule during the 1967-68 season. On the front left tail is the Adidas manufacturer’s tag. Written under “PLAYER ID” is “35 DURANT” in pen. Attached are four flag tags that read "50", “CLIMALITE”, “2007-2008” and “+4 LENGTH”. On the upper left chest is the official “NBA” logo embroidered. 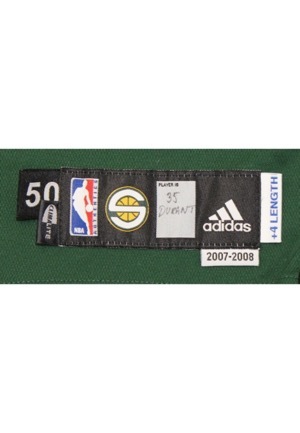 On the v-neck is a SuperSonics logo embroidered. Across the front reads "SEATTLE" in yellow on green on yellow triple tackle twill. The player number “35” appears below and on the back in white on yellow tackle twill. Across the back reads the player name “DURANT” in white tackle twill sewn directly onto the green jersey. This jersey is properly tagged, was presented to us as game-used and in our opinion shows appropriate use.